“Taffy” Williams joined RLS in 1924. He’s listed in Paul Poornan’s Royal Latin School as teacher of English and French and therein lies irony. 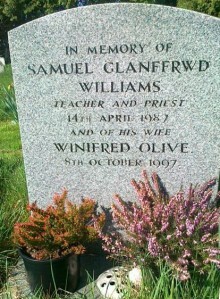 Samuel had been born in Welsh-speaking Aberdare into a large family and until he was 16 he had no language save Welsh – even school examinations were taken in his native language. Boys in the Williams family were destined for “the pits”. Samuel survived through his own endeavours and he must have shown a facility with languages: English, French and the subject which defines Taffy for most living Old Latins, Latin. 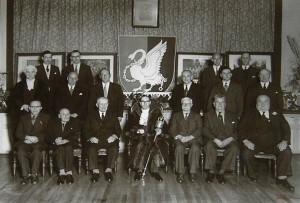 Geoff Kirk comments on that picture:I don’t suppose you realised that it is ME standing right behind him – in that row from left to right – are – Jim Faulkner; David (Popeye) Stopps; ME!!! ; Ray Hodges; Ann Kelly; Betty Scott. I haven’t changed much have I [True, Geoff I can see “U” in “‘Im”] – slightly different hair style, I suppose. (And I guess you know that the lady teacher [to GKE’s left] is Miss Merritt – in whose house we now live. Ann Kelly is the girl who’s uncle made the Old  wooden Lectern that was used last Wednesday at the Archives afternoon! 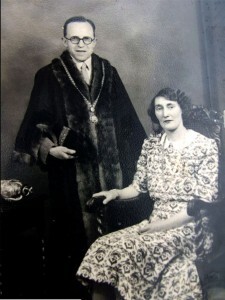 Taffy Williams married Olive Eales, the Belle of Maids Moreton – even its Rector is said to have “given her the eye” – and they settled down together in Avenue Road, Maids Moreton, in a house next to Olive’s parents. Olive was a teacher, too, and served many years at Lillingstone Dayrell C.o.E. Primary School. She helped with Brownies and Guides and played an important part in the 1927 Maids Moreton Pageant that received national publicity through the Daily Sketch. 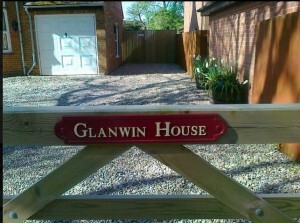 Once Taffy became a priest he gave his Avenue Rd house, appropriately named Glanwin House: Glan from the Welsh for Grandfather and win from Nan, to his son and family that included Roxanne. 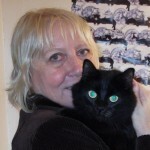 That was gratefully received and a source of some stability to them for Taffy’s son, Hilary, had an up and down sort of existence. He was an activist and could be confrontational -writing letters regularly to the Buckingham Advertiser, and sending notes to people who had made spelling errors. Sadly, Hilary died all too young, having tried to run a kennel in the remote north of Scotland. Taffy and Olive’s daughter is Gloria and she attended RLS. 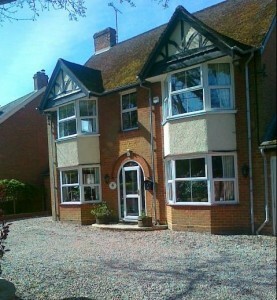 Afterwards, Gloria trained as a teacher and became head of a school in Colchester. Eventually “Taffy” Williams became the Senior Teacher (one down from Deputy Head) at RLS and the Churchwarden / Lay-Reader at St Edmund’s, Maids Moreton Parish Church. Taffy had one of the church’s bells cast in his name in Maids Moreton when they where were re-hung. Mr Williams must have retired from teaching a year or two before I joined RLS. He returned, I remember, to preach at the RLS Founders’ Day service around 1970. By then, Taffy had taken holy orders. What I hadn’t realised until recently when I chatted to his adoring grand daughter, Roxanne who remains in Buckingham, is that Taffy Williams moved to be a curate in Chipping Norton, where Roxanne spent many happy days, and later he became the fully-fledged Rector of Akeley and Leckhampstead. When he retired from that post, he left the rectory at Akeley, and bought Fenton House in Chipping Norton where he once more helped the rector . Their grave is in the extension to Maids Moreton churchyard. My grandfather was was perfect in my eyes, such a clever man, I am trying to find the pictures of when he was the Mayor of Buckingham. 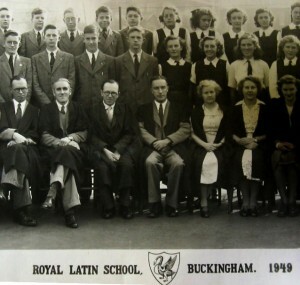 Did you know Eddie Howes, the former Buckingham Florist Grandad taught his wife at the RLS- she was June Roberts, she lives in Highlands Road. She became a good teacher a Padbury School, which my children attended. When Gramps was the Rector of Akeley and Leckhampstead, he used to invite the children from Wicken Park school, then a Girls’ School, and they used to come and sing at morning service, once a month. I loved the Rogationtide Service at Akeley church; we used to stand at each corner of the church and sing, I can’t remember what, but his lovely welsh accent never faded. I’ve received this from Rita [Shaw] March. I post it as a comment for it shows Taffy, post-RLS but still kindly& considerate, willing to do his bit for former pupils.